Self driving cars, as unbelievable as it sounds, are autonomous vehicles that can literally drive themselves – in traffic. It’s a trillion-dollar technology. A self driving car handles all aspects of driving: lane changes, traffic lights, pedestrians, turning, parking, accelerating and even choosing the route. The only thing it can’t do is load fuel. All you have to do is sit and relax en route to Lake Tahoe. Thinking Exponentially, the self driving car phenomena is a predictable and pragmatic development. First, A.I. and Computing have reached a point they can power cars with the intelligence needed. Second, It’s easier to turn cars into robots then a building a robot nurse or house cleaner. Third, the market and economic impact is huge: automation of our vehicle transportation network. Does that mean self driving cars are being testing on public roads? The answer is yes, at last count well over 300,000 miles were driven by Google’s self driving cars as of 2012. Without a single fault accident. That’s the distance from here to the moon – the technology works extremely well. The applications are immense. Imagine, people can now use their time more productively while in transit. Cars can avert accidents at the last second. A blind person can drive from their home to the grocery store. Self driving cars are in many ways superiors to human drivers. They see 360 degrees all the time. They can see in fog, understand the road conditions, and respond quicker than a human ever could. They never get tired, bored and speed. They continuously analyze, plan and respond to the changing environment. In many ways they are the perfect driver. Google is the undisputed leader in this field. Sebastin Thrun who heads up the project at Google, won the Darpa 2005 Grand Challenge for Stanford University in 2005. Google has been developing the technology ever since. This technology could be in the hands of consumers in 3-5 years. The challenge now is two-fold. First, the cost has to come down and that will happen with volume. Second, regulatory and insurance hurdles must be crossed. In this case law and regulation, not technology, will be the bottleneck. Nevada and California have issued test licenses. By Thinking Exponentially, what happens if you combine crowd sourced car sharing and autonomous cars? Instant car fleet anywhere anytime. Its one of the reasons I am the lead investor in Getaround, a car sharing company that recently raised $13.9 Million. 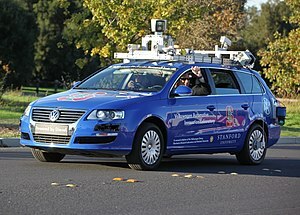 Self driving autonomous cars are just one example of the upcoming robotics revolution. Another amazing development is the 3D printing of cars. Wired Magazine recently announced that the world’s first 3D printed car is nearing production. Imagine 3D printed self driving cars, an impressive intersection of technology trends.